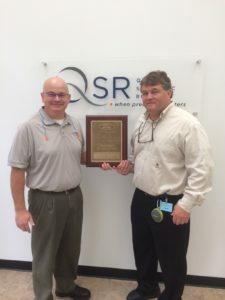 The Jasper, Georgia facility of Quality Synthetic Rubber (QSR) was recently awarded Ford Motor Company’s Q1 Certification, which is considered throughout the world as an indication of exceptional quality and customer satisfaction. The Q1 Certification is awarded to Ford suppliers who demonstrate excellence beyond the ISO/TS certification requirements in five critical areas: capable systems, continuous improvement, ongoing performance, superior manufacturing process and customer satisfaction. • Q1 “score” must exceed 800 points (maximum possible score is 1750). Jasper’s current Q1 score is 1325. “Receiving this certification is the direct result of Jasper associates’ hard work and commitment to quality. 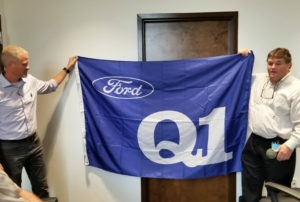 I am very excited that the team’s dedication has paid off in the receipt of the Q1 Certification since it’s one of the most prestigious in the automotive industry,” says Freddy Walker, QSR Quality Manager.